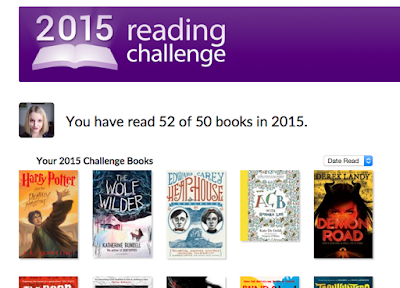 In 2015 I managed to read 52 books, yippee! This count includes novels, I didn't include any graphic novels, of which I think I read about 7, but for 2016 I reckon I will include them in the count because they're a kind of novel after all! Same goes for audio books, and non-fiction: all book based reading counts in 2016. -Read more graphic novels: The seven I read in 2015 listed above were excellent, so in 2016 I'm going to try to read a few more, maybe even once a month. Plus book buying excuse!! -Read some feminist lit: There are a few feminist books that have been on my wish list for ages and ages and I really should get round to reading them. Roxane Gay's Bad Feminist, Men Expain Things to Me by Rebecca Solnit, The Beauty Myth by Naomi Wolf, and Laura Bates' Everyday Sexism are all on the list to conquer this year. -Read more adult fiction: As in not exclusively young adult fiction, not 'adult' in that way you dirty sods. Now I think there are very exciting things happening in young adult fiction, which is why I read so much of it, but a few big fiction books managed to pass me by last year. I'm a 'proper adult' so I reckon I could manage some proper adult fiction. -Read some classics: I tried to do this last year, I may have failed. But I want to tackle some classics this year, cos you know, some of them are meant to be good and you know, self improvement.